Holy crap! That's my assignment! This is guy is so right! I especially love the big letters saying: THEY. DONT. Plants interact in the traditional sense primarily through pheromones. For example, some species of acacia, when being attacked (aka eaten by an animal) release a smelly sap to discourage the animal as well as a pheromone signal to other acacias in the grove. These other acacias, even though they haven't been attacked, will also release the smelly sap preemptively upon receiving the pheromone signal, encouraging the attacking animal to find its meal elsewhere. The more of these I look at, the more I realize how stupid school was. I should've just screwed around and made people laugh. This is hilarious! 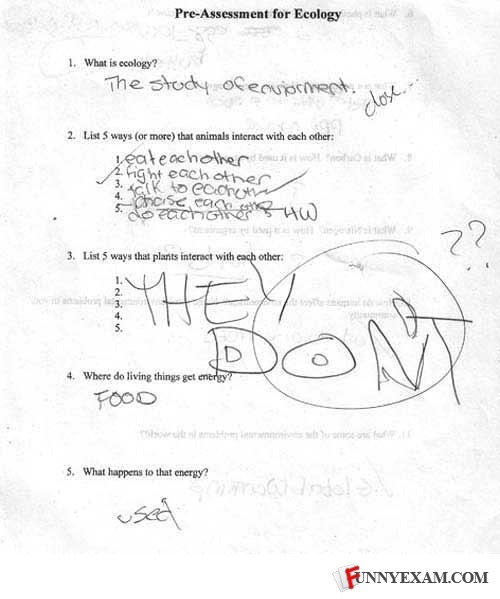 OMG this is the test I took in 7th grade those are my answers. Where do living things get energy? "FOOD" What happens to that energy? "USED"
Reminds me of Ollie Williams. "Where do living things get their energy" "Food" "What happens to that energy" "used" Brilliant! It say's do each other's HW not do each other. Animals talk to each other?! Lmao!! Pea plants actually signal each other about droughts and stuff through physical touch. oh my god this looks exactly like a test I took in science! haha he actually got the animal question right, technically humans are animals. Did anyone else notice that the answer to number 5 on question 2 is "they do each other's hw"? the last one was "do each other's HW" do each other's home work, which , humans being animals, its technically correct. What can you say, Plants are antisocial. he gave up on the bubble letters. adhd? Animal (number 2) "do each other" LOL! Anyone else see the angry face? I'm guessing he didn't get accepted into the course! Stupid idiot.